The vehicle identification number (VIN) is a seventeen-digit combination of letters and numbers. The VIN is stamped on a metal tab riveted on the instrument panel, top upper left of the dash. The VIN is also found on the vehicle certification (VC) label. 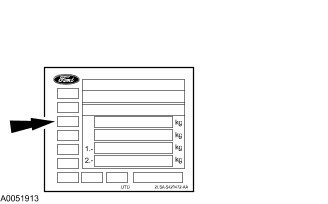 The first three vehicle identification number (VIN) positions are the world manufacturer identifier. The fourth VIN position is the vehicle brake type and gross vehicle weight rating (GVWR) code, all vehicles use hydraulic brakes. This code may also identify the vehicle safety restraint system. 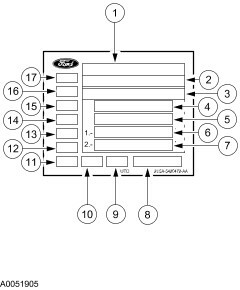 VIN positions five through seven indicate the vehicle line, series and body type. The eighth VIN position is the engine type (displacement and number of cylinders). The ninth VIN position is a government assigned, computer-generated check digit. The tenth VIN position is the model year code. The eleventh VIN position is the assembly plant code. VIN positions 12 through 17 are an alphanumeric code for the vehicle build sequence. This is also the vehicle serial and warranty number. Paint codes may be listed as a two-part code. The first set of characters listed indicate the vehicle primary body color code. The second set of characters listed (if applicable) indicate a two-tone or accent body color code. All colors are base coat/clear coat. Trim codes are listed as a two-part code. The first character listed identifies the trim type. The second character listed identifies the trim color.